This entry was posted on Saturday, January 4th, 2014 at 10:35	and tagged with character description, Gauguin, inspiration, portrait, Setting, Van Gogh, writer, writers, writing, writing exercise and posted in Uncategorized, Writing. You can follow any responses to this entry through the RSS 2.0 feed. To answer your question and not knowing anything about either artist: It seems to me that someone sitting in “Gauguin’s Chair” regularly is a dapper fellow. Hair neatly parted and combed down. Keeps his fingernails clean. A little on the portly side. This chair is in the house, like in the parlor or sitting room. Now the person sitting in the second chair; I see a skinny man, shirt untucked, fingernails crusted with paint. Paint smears on his pants, white hair flying around like Albert Einstein. This chair is in front of an easel, in a studio somewhere. Blue salt water outside the window, grey cliffs. Why? No idea, but that’s what I see. Thank you for a thought provoking post, I will be checking back for more. Hi Monique, thanks for the comment. I agree with your imagining of the ‘Gauguin character’ as suggested by Van Gogh’s portrait. I also imagine a Hercule Poirot-ish type gentleman. I feel that Van Gogh is saying he’s learned and urbane and sophisticated and intellectual but also arrogant, pretentious and slightly dark. As for Van Gogh’s self-portrait, yes, I think he wanted to portray a down-to-earth character, a hard worker, a man not afraid of getting his hands dirty. It’s interesting that he paints himself as the ‘brighter’ character – this was possibly not the case. Of course, these portraits are Van Gogh’s perception only. I love that you saw sea and cliffs. Thanks for taking the ime to do this exercise. I hope it was beneficial. What a fascinating and inspiring concept! I should definitely have to consider the question of what kind of chair my characters would prefer the next time I’m in either a block or a character developing mood. I really love the idea. I feel Gauguin’s chair, with all its curves, seems like more of a comforting, embracing type; the kind of chair that you’d get comfortable in. Van Gogh’s, by contrast, is much more straight and stark, not so much welcoming as it is functional. Very, very interesting! Thanks Ellis, I have found this a useful exercise – and I’m happy you think so too. Yes, I agree, Guaguin’s character, Van Gogh’s interpretation anyway, strikes me as one who is rather self indulgent and Van Gogh himself more puritan, hard on himself, perhaps rough around the edges. Gaugin’s chair does not welcome me. The dark colors and the more sophisticated nature of the chair’s construction cause me to envision a pretentious man, convinced of his own natural genius. This is someone who adores the sound of his own voice. Convinced that everyone else is beneath him. He is fussy about this work space and even fussier about his appearance, but not in an endearing, eccentric way. This is man who would quickly get on my nerves. 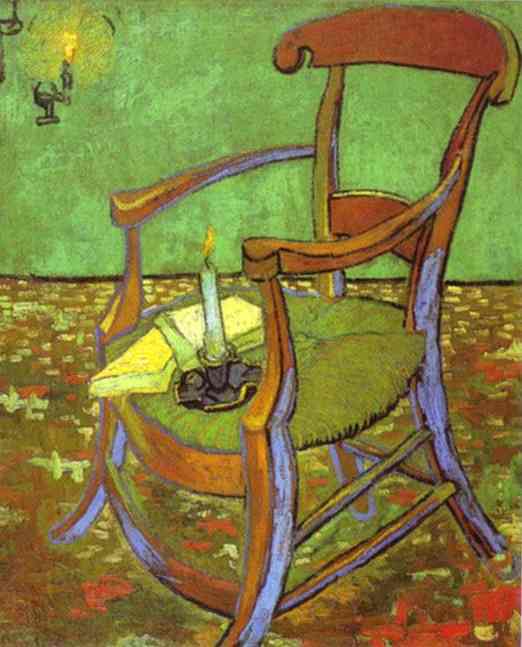 In contrast, I think I could have a jolly time with the man sitting in Van Gogh’s chair. He is simple, he has energy, he likes to laugh (despite what we know about his emotional struggles). He is full of dreams and can hear the stars singing. He paints because he has to, because it is as essential to him as breathing, not because he feels he is important. Thanks for commenting. Yes, I feel that Guaguin was probably getting on Van Gogh’s nerves for the reasons you outline, by the time he painted these pictures. 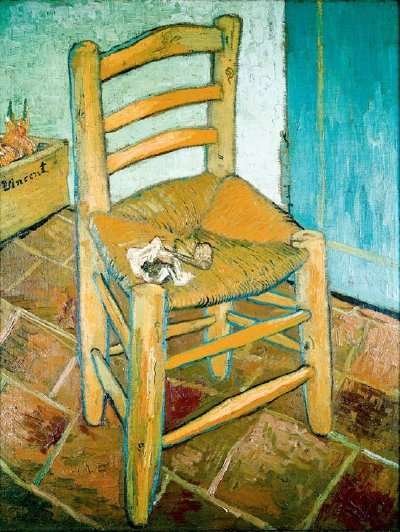 As I mentioned in the piece, I find it interesting taht Van Gogh portrays himself as ‘bright’ whereas that is not quite the historical impression we have of him (though, who knows) The man who owns the peasant chair certainly seems more approachable than the man who frequents the carved, curved, polished parlour seat. I’d never really thought about how the character and the setting must match, but it seems that unconsciously I was aware of it. When I wrote my book Captive Echo my central character was a big man who drove a big car, and was staying in a big country house. When I came to wrtite the sequel I had him return to the large house – not because it was necessary for the story (it could have been set anywhere), but becuase it suited his personality. How observant of you to see this: I would never have done so. Yes, I think a lot of writers will do this instinctively – as when you picture your character, you imagine them in suitable surroundings. However, it is a good exercise to stand back and have alook at why you’ve put them in a large house etc… I think. Thanks for the comment! P.S – I’ve bookmarked you. Thanks for following my blog. Glad to meet you. I like your concept here. I can’t draw at all, but I like the idea of placing the character in his setting and finding out what kind of person he is. It’s a helpful tool. I’ll follow your blog in Google reader. Hi Marlene, And thanks for following me. I find that other artistic forms provide inspiration and to get a flow going between writing and (for example) dance – is very beneficial. I’m glad you find it helpfu. What an interesting study, to take a look at the artifacts we associate our characters with and understand why they are connected and how they can bring out the personality in one another. (As someone who studied interior design, I think this is important to understand.) This can very much be helpful in “painting a (word) picture” and creating certain moods, I think. The objects we choose and the words we use to describe them become the pigments and blends with which we paint. With Gauguin’s Chair I get the feeling he likes things with a certain artistic flair–a C scroll here, some gentle curves there…but he still values simplicity. He could be sitting in an elaborate baroque chair, but no. It has minimal ornamentation yet is not completely utilitarian. Also, the candlelight and books suggests he likes to read sometime in the afternoon/evening, perhaps as the day winds down and he’s looking for something relaxing to do. And the colors are all earthy. You can also tell there’s some natural light shining on the side of the chair. To me this suggests he likes to have a view to the outdoors as he’s reading, perhaps something to look at after reading for a while to give the old eyes a break. The colors in his portrait, to me, suggest a liking for, or a proximity to, water–perhaps a lake or an ocean, or sea. A reflection of the surrounding environment? Combined with the terracotta-colored floor tiles, it also feels kind of Mediterranean. Maybe he likes breezes and being around seaside cultures. However, I don’t know if this is more a reflection of where he was at the time or somewhere he’d like to be but isn’t? An idealistic portrait. Knowing the life he lived and the fate he met with…he just doesn’t seem like a very “breezy” personality. Though, I could certainly understand why he might long for such surroundings as portrayed in this last painting. Yes! I wasn’t sure if those were onions or something else, haha, so I didn’t comment on them. But your interpretation makes complete sense. Poor Van Gogh always saw everyone and everything else around him more beautiful and inspiring than himself. I believe this personality disorder was one of the reasons he painted the way he did – with unbridled passion and zeal that most others saw as unusual. When you think about it, it’s the artists (and anyone else for that matter!) who think outside-the-box who are the ones who are later recognized at the greatest. Everything Van Gogh did was bizarre and brutal to his sense of purpose but he was always able to see a brilliant, pure ray of light from the heavens that gave us all something to admire for the ages. Hi James, Thanks for the comment, gorgeously put. True, if we’re not prepared to ‘do different’ and take risks we’ll not achieve the heights. I like your blog a lot btw. Thanks for citing my blog, Tiyana!